In a single desktop package, the Copystar/Kyocera-Mita FS-3040MFP gives you B&W laser printing and copying, plus color scanning. Designed for high volume users, this network-ready, duplexing printer can print at speeds up to 42 images per minute. In case you’re wondering, Copystar is a division of Kyocera-Mita, and many of the FS models found on the market brandish labels from either company. Starting at 56 pounds with a 19½ inch square footprint, the FS-3040MFP multifunction is a little large for your desk. Sitting the Copystar on a table or credenza will give more than enough clearance to use its automatic document feeder and its 21 ½” height allows you to make copies and scans without having to stoop. Originals can be placed on the 11” x 14” glass platen for scanning and copying single pages or books. The Reversible Automatic Document Feeder (RADF) allows for two-sided scanning of up to 50 originals at 42 images per minute to keep up with the top speed of the printer. After a 22-second warm-up, in less than 7 seconds the FS-3040MFP starts printing at speeds up to 42 letter-sized (or 40 A4 size) pages per minute. At the maximum resolution of 1200 x 1200, the Copystar is great for sharp monochrome printing of small fonts and detailed graphics. The built-in duplexer gives you the flexibility of 2-sided printing. This model has the largest set of print emulators: from the industry standard HP PCL6 and Adobe PostScript3, to PDF, IBM ProPrinter, PRESCRIBE, the old Epson LQ-850 and Diablo 630 languages. Up to 999 color copies can be made with the FS-3040MFP at 42 pages per second. The copy function has three different exposure modes to handle text to photo reproduction. The magnification can be automatically or manually changed from 25% to 400% in 1% increments or in 12 presets. Originals can be scanned in color from resolutions ranging from 200 to 600 dpi. Scans can be saved in the popular JPEG, TIFF, PDF, XPS formats, or sent directly back to the computer, USB drive, or e-mailed. Maximum scan speed at 200 dpi is 35 B&W images per minute. The scanner supports TWAIN and Microsoft’s WIA. One of the nice features about this Copystar is the cassette paper tray is capable of holding an entire ream of legal-size paper. 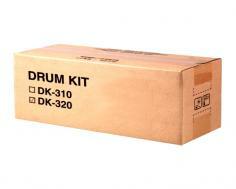 Non-standard materials up to 8½” x 14” are loaded into the 100-sheet multi-purpose flip tray. Up to three more 500-sheet trays can be stacked to the FS-3040MFP, bringing its total capacity to 2,100 sheets, ideal for businesses that go through a case of paper in a month. 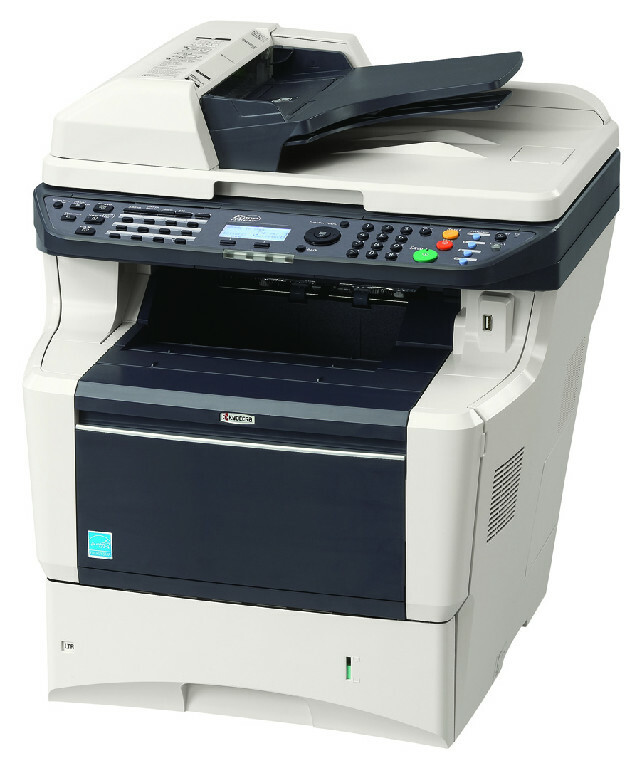 The FS-3040MFP can be either connected directly to a computer through its USB 2.0 port or over a network via 10/100BaseTX Ethernet. Starting with the 256MB memory and having an additional slot for expansion to 768MB, the printer can more than handle additional workloads of a large department or classroom. In spite of the fact that most business correspondence is by e-mail, for various reasons certain institutions (mostly the financial ones) still require certain forms and contacts to be faxed instead of just accepting an e-mail with the scanned document attached. If Copystar added a facsimile mode, this would be the perfect all-in-one for any office or home business. Review it: "Kyocera Mita FS-3040MFP "
A pull-down drawer on the front of the Copystar allows for easy access to the toner. 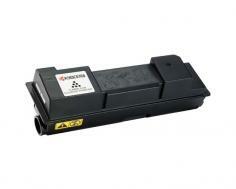 The FS-3040MFP toner comes in a standard cartridge good for 15,000-images. Just remember toner yield numbers are based on the always asterisked “5% ink coverage per letter-size page”. To give you an idea of what that mean’s: a standard business letter uses 5% ink coverage; a newsletter, 30%; and a page with graphics, text, and photos can exceed 60%.